For two centuries now Moleskine® (mol-a-skeen'-a) has been the legendary notebook of artists, writers, intellectuals and travelers. From gifted artists Henri Matisse (1869–1954) and Vincent van Gogh (1853–1890), to poet and leader of the surrealist movement André Breton (1896-1966) to Ernest Hemingway (1899-1961) considered the most influential writer of the last century, to famous travel writer Bruce Chatwin (1940-1989). These notebooks have proven they can withstand the trials of travel and abuses that ensues from normal use. This is the one true trusted travel journal. For over a century a small French bookbinder supplied Paris stationery shops with this simple black book where the artistic and literary avant-gardes of the world browsed and bought them. Writer-traveler Bruce Chatwin used to buy his moleskine at a Paris stationery shop in Rue de l'Ancienne Comédie, always stocking up before going on his infamous journeys. It was Bruce Chatwin that called this little black notebook, "moleskine". He gave his friend Luis Sepùlveda, a Chilean novelist, a precious moleskine before a trip to Patagonia. It was precious because by then the notebooks were no longer to be found, as the small family concern in Tours closed down. "Le vrai moleskine n’est plus" were the lapidary words of the stationer to Chatwin who had ordered one hundred before leaving for Australia. Now, the Moleskine® tradition continues by Italian manufacturer Moleskine Srl. It can go back to being a witness, passing from one pocket to another and continue the adventure. Moleskine paper and journals are so popular that they have inspired various blogs by true fans of the brand. 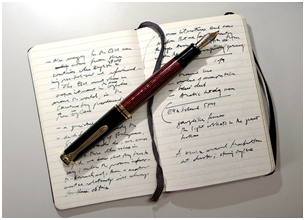 Many of these blogs celebrate the various uses of Moleskine from travel blogs, class notes, drawings or journals. Check out and be inspired with details of the brand from some its most passionate admirers. With a variety of sizes, pages and colors to choose from the possibilities are endless!